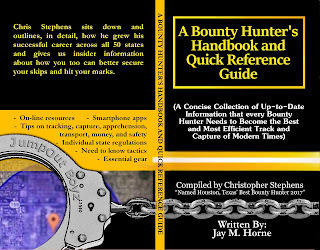 The most complete and comprehensive guide to bounty hunting has just been released as an ebook for review by followers of Christopher Stephen's (Cowboy). Be the first to get your hands on the most essential tool in the world of track and capture at only half the price. For the price of a quick lunch, you can have the most valuable piece of gear in your arsenal right at your fingertips. This product will make money come faster and easier during the apprehension duties of public service. As a purchaser of the ebook during Bookflurry's soft release window, you will have the unique opportunity to provide valuable feedback on things you would like to see included in the hard release of the second edition paperback in mid February. Your positive feedback is so valuable to the publisher that if your suggestions are implemented and inserted into the paperback second edition, to be released next month, you could receive a complimentary signed edition, delivered to your door. Five star reviews from official purchasers on amazon are one of the most valued things during a soft release. Bookfurry and Christopher Stephens are dedicated to providing top-notch customer service, and immediate resolutions to any issues with our initial ebook and paperback release. We urge you to contact us privately with any concerns at our contact us page, and leave only your most honest positive feedback on our Amazon product page where you purchased your book. This limited first edition is rare and will only last for 30 days; after which the ebook will be updated with all the suggestions and edits that fans request and the paperback will hit shelves across the globe. After purchasing the ebook, you will have the option to update the first edition to the second edition at no charge after hard release date. So, there is everything to gain by investing in 'A Bounty Hunter's Handbook and Quick Reference Guide'. Convenient hyperlinks in the ebook and a full index in the paperback make navigating the information a breeze. Anyone who wants to find someone needs this book! Bounty hunters, private investigators, and skip tracers will find everything they need within these texts. Bookflurry publishing and Christopher Stephens (Cowboy) 'Named Houston, Texas' Best Bounty Hunter of 2017' want to thank you for your continued support and wish all of our followers a safe and profitable new year!